This weathered beauty is a stem fragment of the articulate crinoid Apiocrinites negevensis from the Matmor Formation (Middle Jurassic, Callovian) of the Negev, southern Israel. The regular divisions you see making up the stem are the columnals, which look a bit like a stack of poker chips. You can even make out the crenulations on the articulating faces of the columnals, seen as tiny zig-zags. What is unusual about this stem, of course, are the large swellings with multiple holes. These appear to be something like the galls you sometimes see in plant stems formed when a parasite is surrounded by living plant tissue. These infected crinoid stems were first described from the Matmor by Feldman and Brett (1998). They suggested they were from parasitic myzostome worms, which are usually found on crinoid arms and have a long fossil record (see Meyer and Ausich, 1983, and Hess, 2010). They could also be from some sort of embedded organism like that represented by Phosphannulus on Paleozoic crinoid stems (Welch, 1976). 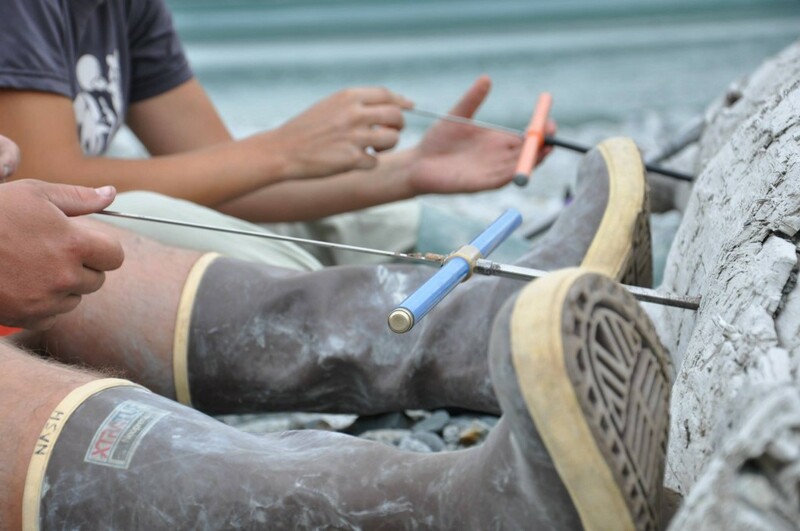 Lizzie will be pursuing the mystery by careful sectioning some of these swellings and seeing if she can relate the crinoid skeletal growth patterns to either a borer or an embedded parasite. Unfortunately that means we must destroy some specimens to better understand the phenomenon, a classic dilemma paleontologists sometimes face. Hess, H. 2010. Myzostome deformation on arms of the Early Jurassic crinoid Balanocrinus gracilis (Charlesworth). Journal of Paleontology 84: 1031-1034. Meyer, D.L. and Ausich, W.I. 1983. Biotic interactions among recent and fossil crinoids, p. 377–427. In: Tevesz, M.J.S. and McCall, P.L., eds., Biotic interactions in recent and fossil benthic communities. Plenum Press, New York. Welch, J.R. 1976. Phosphannulus on Paleozoic crinoid stems. Journal of Paleontology 50: 218-225. 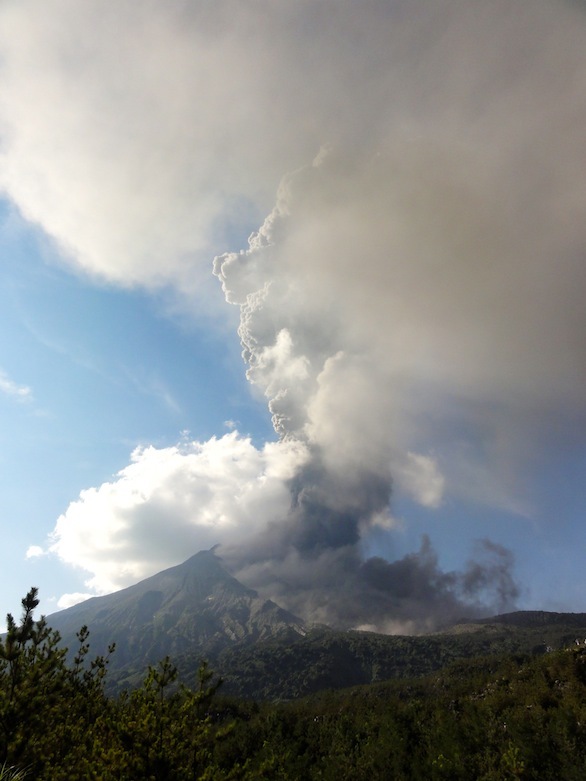 KAGOSHIMA, JAPAN – Although the eruption of Sakurajima on the mid-conference field trip was the ultimate highlight of the IAVCEI 2013 Scientific Assembly, let’s not forget that there were also four full days of excellent talks and posters on the cutting edge of research in volcanology. Sakurajima at sunset, from Kagoshima. A revolution in our understanding of how continental crust is made – In his keynote address, Yoshiyuki Tatsumi explained a new model for generation of intermediate continental crust in subduction zones. 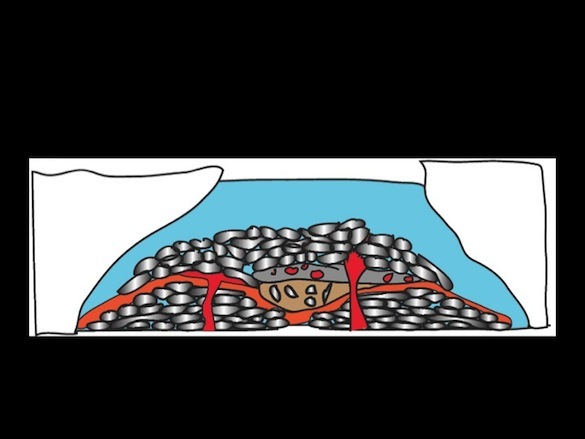 In the model, the subduction factory also generates a dense anti-continent that sinks to the base of the mantle and is recycled in hot-spot plumes. 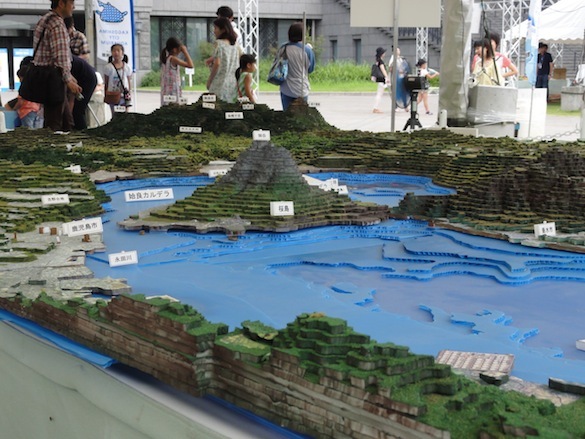 A novel way to visualize volcanic terrains – Tatsuro Chiba and his collaborators have developed a way to visualize volcanic features even when they are shrouded by dense forest. Their technique, which combines slope angle with topography openness from LiDAR data, is called the Red Relief Image Map (RRIM). An online resource for volcanology research, collaboration, and education – Vhub.org is a one-stop-shop for all things related to volcanology. Users can access software for simulating volcanic processes, educational materials, and a variety of data sets. A RRIM of Sakurajima hangs in the Sakurajima Visitor Center. Thanks to all ~1,100 international scientists for making my first IAVCEI conference a memorable experience! I look forward to seeing all of you again in 2017, when the next scientific assembly of IAVCEI will be held in Portland, Oregon. KAGOSHIMA, JAPAN – One of the IAVCEI 2013 mid-conference field trip stops was to Takachino Bokujo (farm) just north of Kagoshima. 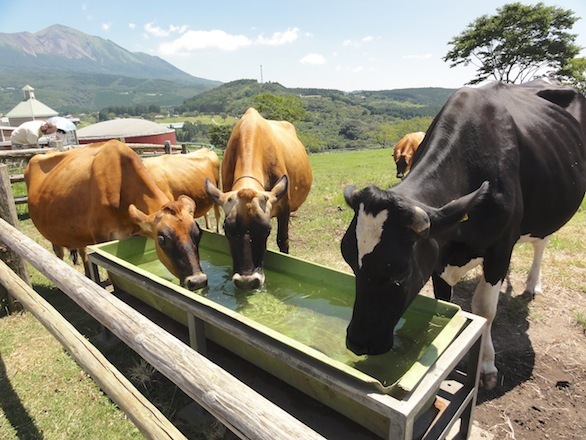 Takachiho Farm is an operating agricultural facility where visitors can milk cows and pet sheep. Although the farm animals (and mini go-carts) were great fun, our real goal was to see the fantastic view of the Kirishima volcano. Kirishima volcano is actually a volcanic complex consisting of over 20 cones covering an area of ~600 square km. Karakunidake is the tallest peak of the Kirishima volcanic complex while Ohachi is the site of Kirishima’s largest recorded historical eruption. 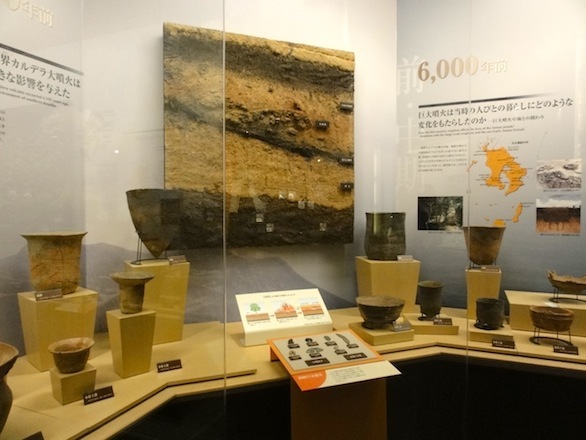 According to the guidebook, the younger cones in the Kirishima volcanic complex have erupted repeatedly since the Pleistocene (starting about 300 thousand years ago). 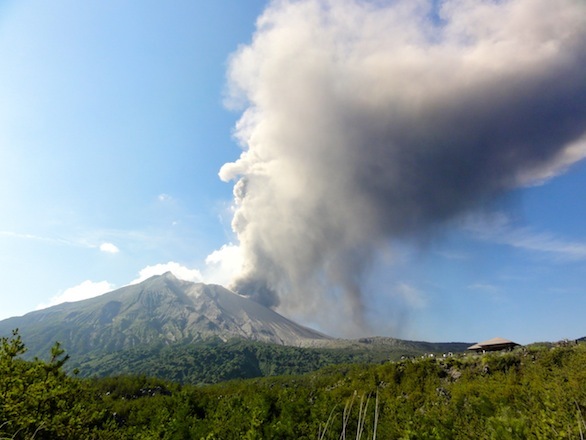 The most recent eruption occurred in January, 2011, at Shinmoedake volcano. It was a violent eruption that ejected pyroclastic materials (pumice, ash, bombs) and formed a lava dome. The guidebook describes shock waves that shattered windows in the nearby Kirishima city. The triangular peak of Takachihonomine is famous for it’s role in a Shinto myth. 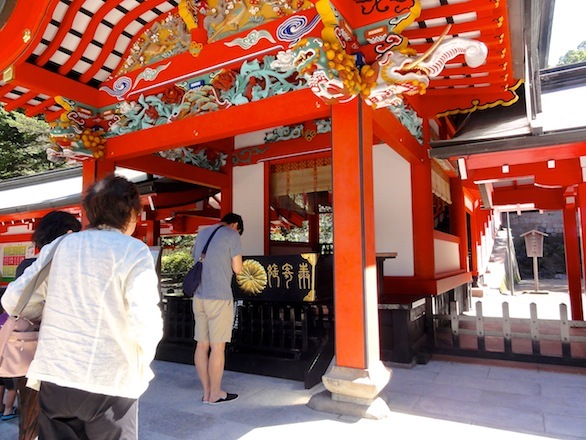 It’s the location where Ninigi-no-Mikoto, the grandson of the sun goddess Amaterasu, descended from heaven to rule the earth. 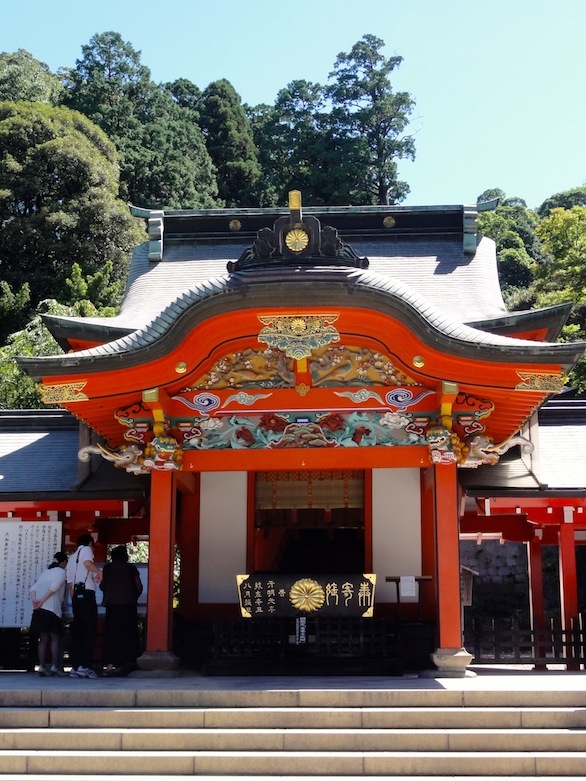 The Kirishima shrine, dedicated to Ninigi-no-Mikoto, is located at the base of the Kirishima volcanic complex. Originally built in the 6th century, volcanic eruptions have destroyed the shrine multiple times. 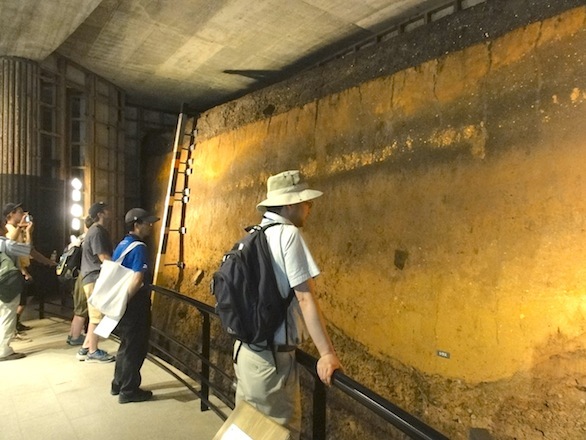 The current structure was built nearly 300 years ago. 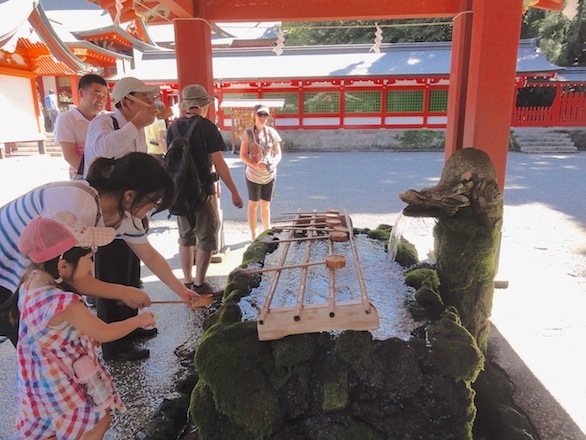 Before offering prayers to Ninigi-no-Mikoto, visitors washed their hands and drank from a fountain. People threw coins as an offering before making their prayer requests. The ceremony involved bowing and clapping twice. 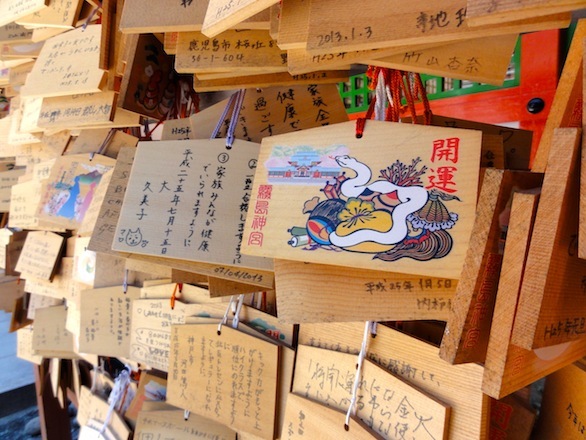 Visitors wrote their prayer requests on the backs of wooden prayer boards, or ema, and tied them to stands on both sides of the shrine. 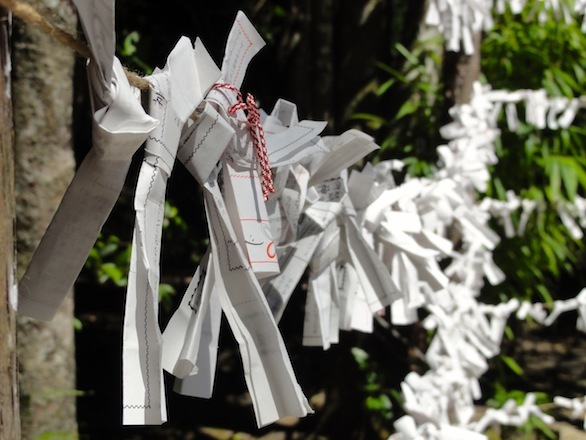 Visitors could also pay to draw a paper fortune, or omikuji, from a box. The papers were tied to a wire fence near the shrine entrance. I was told that leaving the fortune at the shrine would turn bad fortunes into good fortunes. 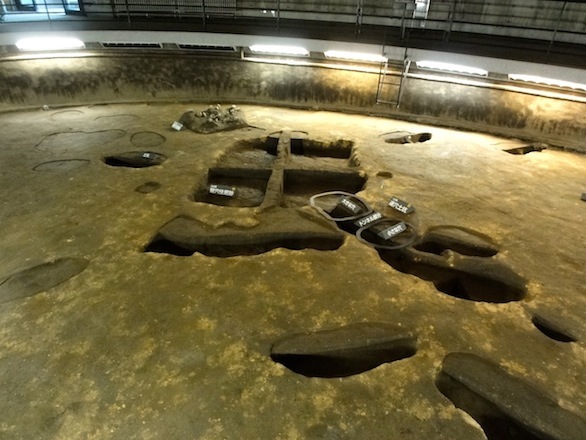 In the Kirishima area, volcanoes play an important role in mythology and the presence of fertile farmland. I can’t think of a better place to observe the interaction between culture and volcanoes. 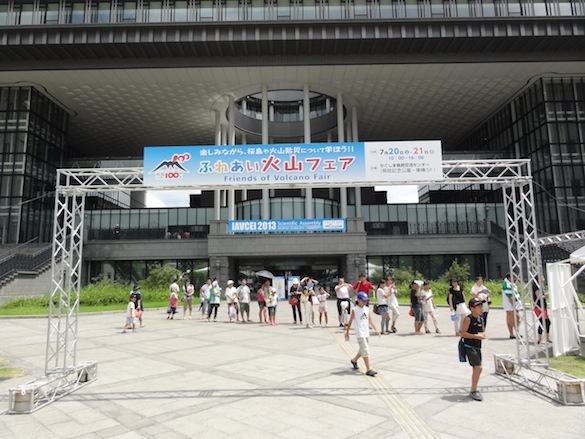 KAGOSHIMA, JAPAN – It was as if the IAVCEI 2013 organizers planned it. 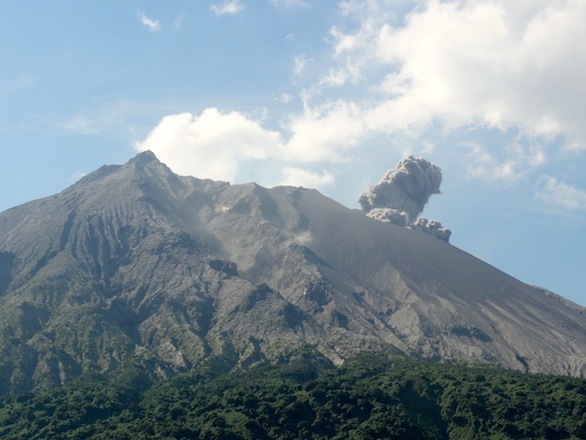 Shortly after arriving at the Arimura lookout on the mid-conference field trip, Sakurajima began erupting. The start of the 22 July eruption. The ash cloud rose from Showa crater, located just beyond the summit as viewed from the lookout. Part of the ash cloud ascended into the atmosphere while some of the cloud flowed along the surface in a pyroclastic density current. A pyroclastic density current is a gravity-driven movement of hot gas and volcanic material. (See this interesting twitter conversation about the difference between the terms pyroclastic density current, pyroclastic flow, and pyroclastic surge). The video below shows the initial eruption cloud as it developed. The eruption column continued to grow as multiple pulses of ash were emitted from the crater. It wasn’t long before the cloud was carried downwind and started depositing ash. Up until this point, the eruption was relatively quiet. Most of the sounds were caused by rockfalls and explosively ejected bombs. Then the volcano made an eerie rumbling noise as the flank began to move downslope. You can hear the collective oohs and aahs as the volcanologists observe the eruption with reverence and awe. At this point, we thought the show was over. The initial eruption cloud migrating away from Sakurajima, depositing ash downwind from the volcano. Soon after the initial pulse, the deep rumbling sounds began again, and we were treated to a second, larger blast. The ash cloud was much darker and we could see large bombs raining down near the base. The second column reached higher in the atmosphere, up to about 3 km is what I heard from one of the volcanologists on the field trip. The volcano continued emitting pulses of black pyroclastic material and was still erupting by the time I had to leave the lookout. 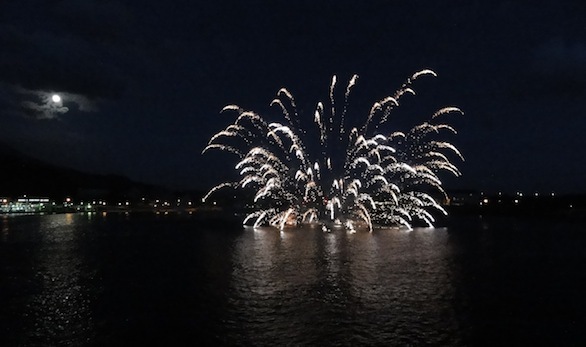 The gala ended with a brilliant display of fireworks against the Sakurajima backdrop. Although the fireworks were truly spectacular, I think most of the volcanologists agreed that Sakurajima’s fireworks were the highlight of the day. If you’re interested in seeing more photos and videos of the eruption, please check out my Google+ album or my YouTube page. Have an eruption story of your own to share? Please comment! 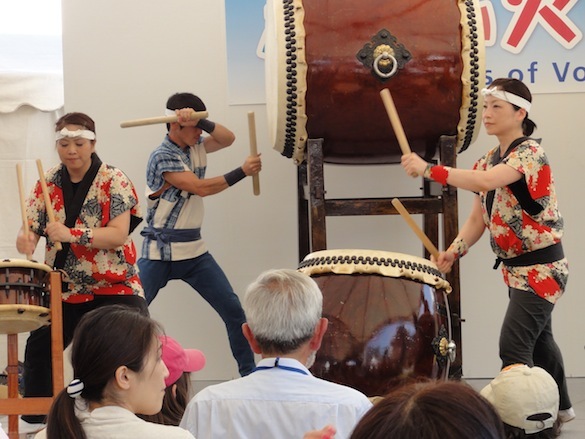 KAGOSHIMA, JAPAN – To commemorate the 100th anniversary of the Sakurajima Taisho eruption, Kagoshima is hosting the Friends of Volcano Fair. The fair is part of an outreach program at IAVCEI 2013 to increase awareness of volcanic hazards. 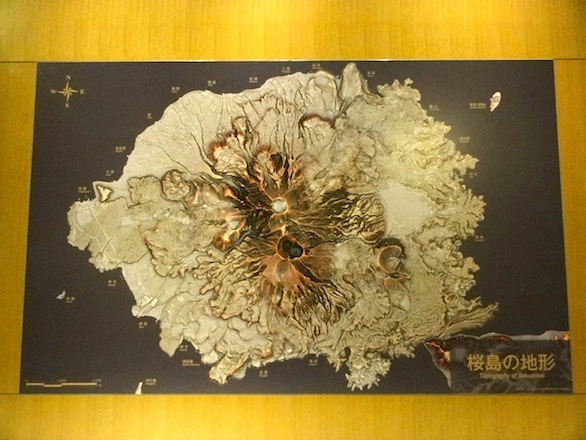 An over-sized 3-D relief map shows Sakurajima nestled snugly into Kagoshima Bay, emphasizing just how important volcanic hazards are to the people of Kagoshima. Rhythmic thumping drew me out of the conference center to the front garden, where I was treated to a drum performance called Sakurajima Hinoshima Taiko, or Sakurajima Island Drums of Fire. 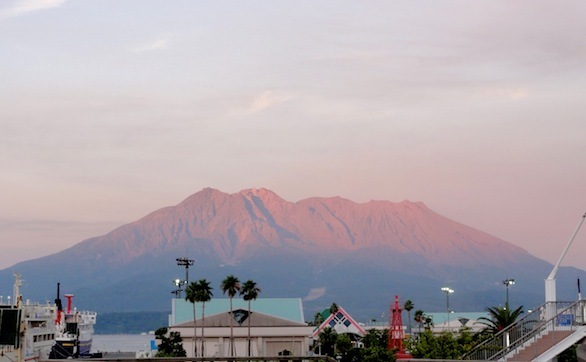 Although there can be negative health effects for those who live near volcanoes, the fair highlighted many of the positive aspects to having Sakurajima as a neighbor. A product display called The Blessings from Volcanoes featured products made from volcanic materials. Local companies are making soaps and other products that exploit the abrasive properties of ash. There were also some novel uses of shirasu (volcanic ejecta) that were new to me. 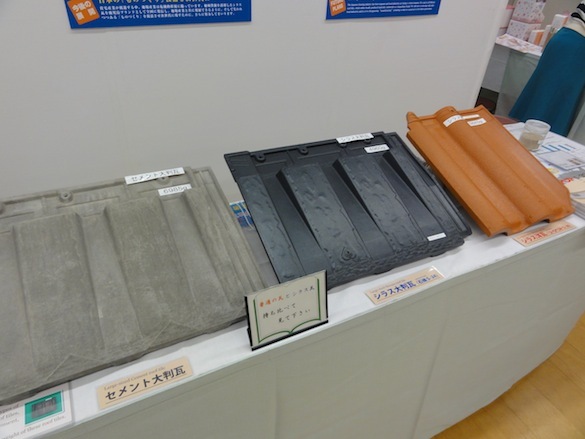 The tiles in the middle and on the right are made of ash, which are much lighter and more durable than the traditional concrete tile, shown on the left. 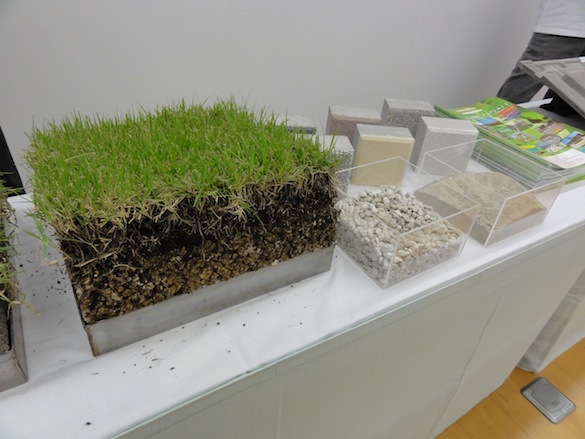 This shirasu greening base is an environmentally friendly landscapting option. It has excellent water retention properties, which can be used to create green space on train tracks, rooftops, and in parking lots. 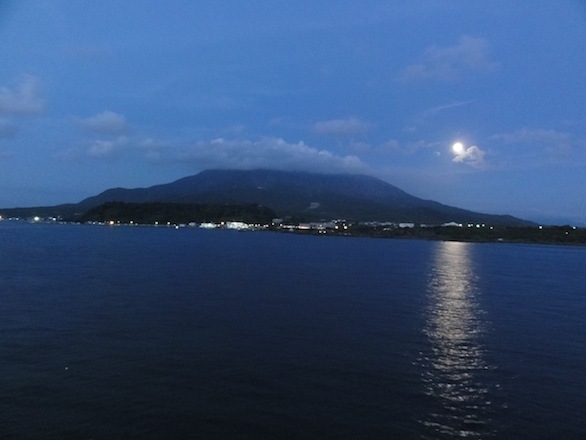 Although the fair was focused on Sakurajima, it also offered an opportunity to highlight some of Kagoshima’s other attractions, like the aquarium. 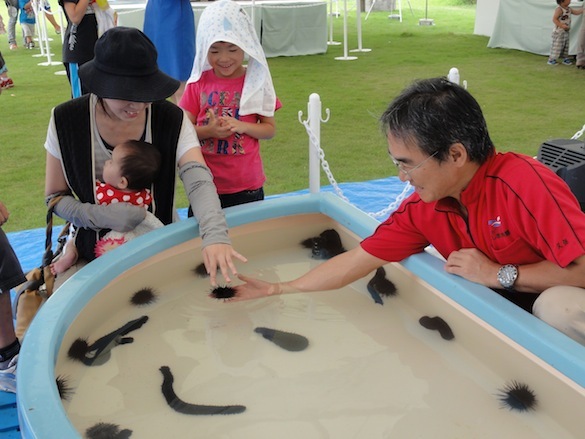 At the aquarium booth, people had a chance to touch sea cucumbers, urchins, and hermit crabs. (FYI, sea cucumbers are soft and slimy). The fossil above is the best of a collection of dinosaur teeth given to us by the generous George Chambers (’79). The species that held it is the gargantuan theropod predator Spinosaurus aegyptiacus Stromer, 1915. The teeth are from Cenomanian (Upper Cretaceous) rocks exposed near Alnif, Morocco. 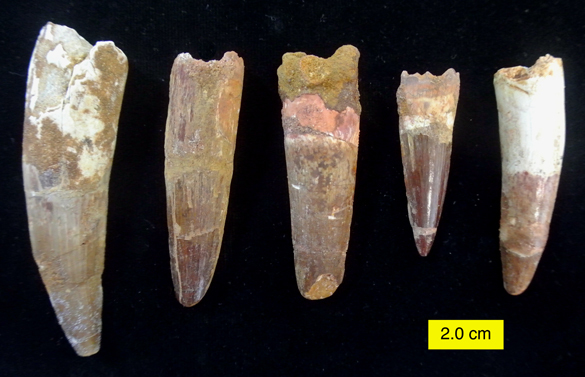 Here are some more of our Spinosaurus aegyptiacus tooth collection. You can see that the teeth have been extensively repaired with plaster and epoxy. That’s fine for us because they’re the only dinosaur teeth we have! Spinosaurus is surprisingly little known in the general public, at least until the Discovery Channel started making incredible videos about the extinct beast. It was the largest of all carnivorous dinosaurs yet discovered — even bigger than Tyrannosaurus, Allosaurus and Gigantosaurus. Some specimens were up to 18 meters long. 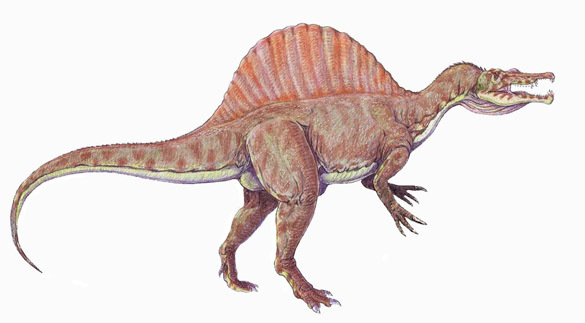 Spinosaurus was characterized by long spines extending up from the vertebrae almost like a pelycosaur. Its head was like that of a crocodile — long and narrow. Its teeth, too, are like those of crocodiles and alligators, being blunt, rounded and strong rather than sleek and sharp. They probably crushed and shook their prey in a crocodilian way as shown in those amazing Discovery Channel videos. The original specimen of Spinosaurus was discovered in Egypt in 1912. Those fossils were completely destroyed when Munich, Germany, was bombed in 1944 by the Royal Air Force. Since then a few other incomplete skeletons have been found, along with lots of teeth. 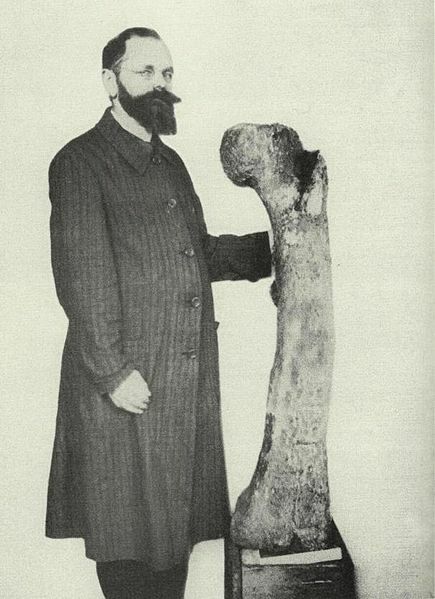 Spinosaurus was found, described and named by Ernst Freiherr Stromer von Reichenbach (1870-1952), a German paleontologist and aristocrat. Stromer’s scientific odyssey is worthy of a movie and is the basis of an excellent book (The Lost Dinosaurs of Egypt). He began his paleontological work in Egypt in 1910 at a time tensions between the British and Germans were ramping up. He fought disease, weather extremes and bureaucratic delays to make his unexpected dinosaur discoveries. As just one example, his fossils actually arrived in Germany in 1922 — ten years after they were collected. (World War I only took up four of those years.) In his latter years he refused to join the Nazi Party and maintained relationships with Jewish friends. This may have led to the destruction of the Spinosaurus specimens because the Nazi director of the Munich museum refused to move the fossils to a safe location. In the end he outlived the Kaiser and the Führer, dying at the age of 82 in 1950. A tough paleontologist in a tough time. Amiot, R., Buffetaut, E., Lécuyer, C., Wang, X., Boudad, L., Ding, Z., … and Zhou, Z. 2010. Oxygen isotope evidence for semi-aquatic habits among spinosaurid theropods. Geology 38: 139-142. Buffetaut, E. and Ouaja, M. 2002. A new specimen of Spinosaurus (Dinosauria, Theropoda) from the Lower Cretaceous of Tunisia, with remarks on the evolutionary history of the Spinosauridae. Bulletin de la Société géologique de France 173: 415-421. Nothdurft, W. and Smith, J. 2002. The Lost Dinosaurs of Egypt. Random House, 242 pages. Smith, J.B., Lamanna, M.C., Mayr, H. and Lacovara, K.J. 2006. New information regarding the holotype of Spinosaurus aegyptiacus Stromer, 1915. Journal of Paleontology 80: 400-406. 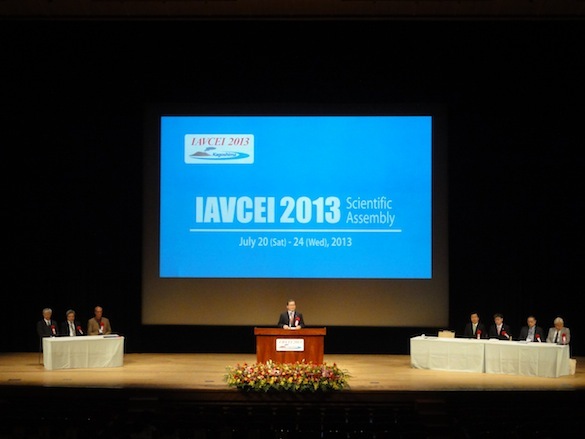 KAGOSHIMA, JAPAN – The 2013 Scientific Assembly of IAVCEI, the International Association of Volcanology and Chemistry of the Earth’s Interior, has officially started in Kagoshima, Japan. IAVCEI leaders and local elected officials welcome delegates from ~60 countries in today’s opening ceremony. 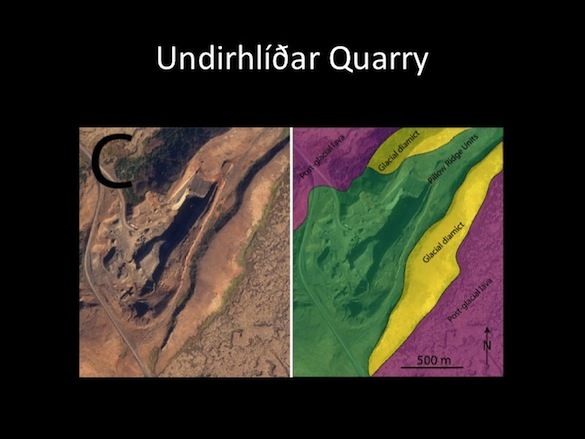 Undirhlithar quarry is a unique exposure that provides insights into the internal architecture of a glaciovolcanic pillow ridge. 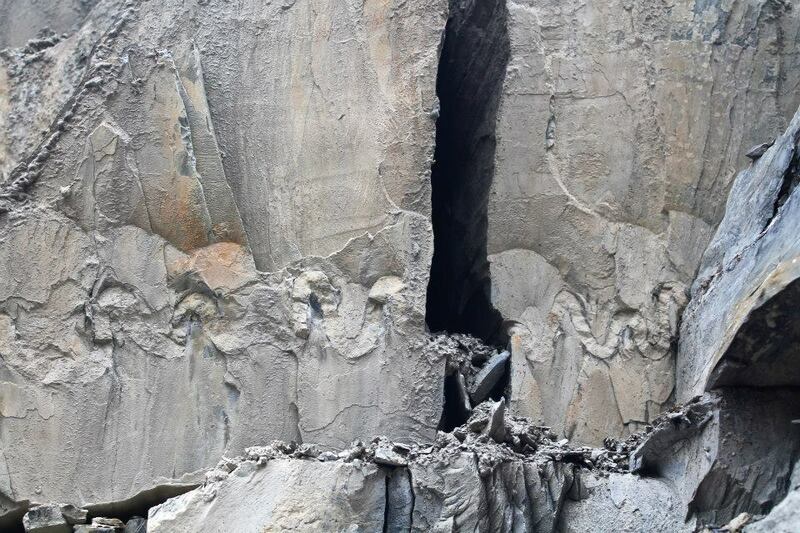 Most of the quarry is made of pillow lavas, which are emplaced during effusive subaqueous eruption. 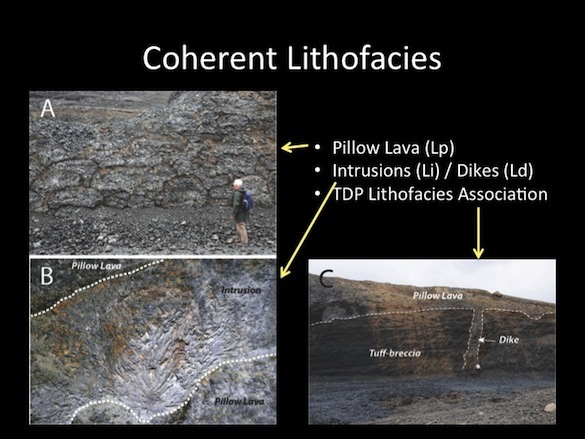 We’ve also identified intrusions and dikes that feed the overlying pillow lava flows. There are also fragmental units in the quarry. The tuff, or fine ashy layers, probably represent periods of quiescence between eruptive events. The tuff-breccia, which has larger clasts, are formed during explosive activity and as a result of gravitational collapse along steep slopes. 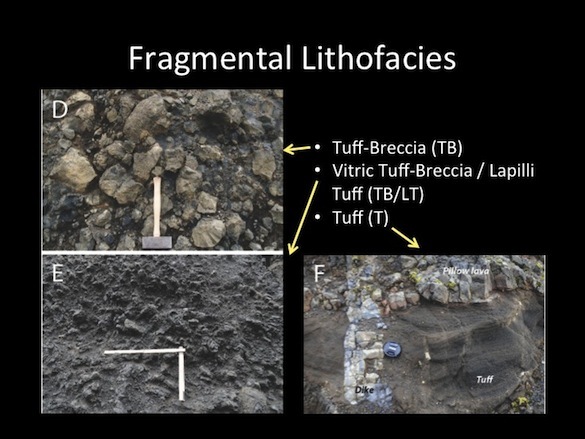 Combined with geochemical and petrological variations, we’ve generated a model for how the units exposed in Undirhlithar were emplaced that involves a complex sequence of multiple eruptive events. 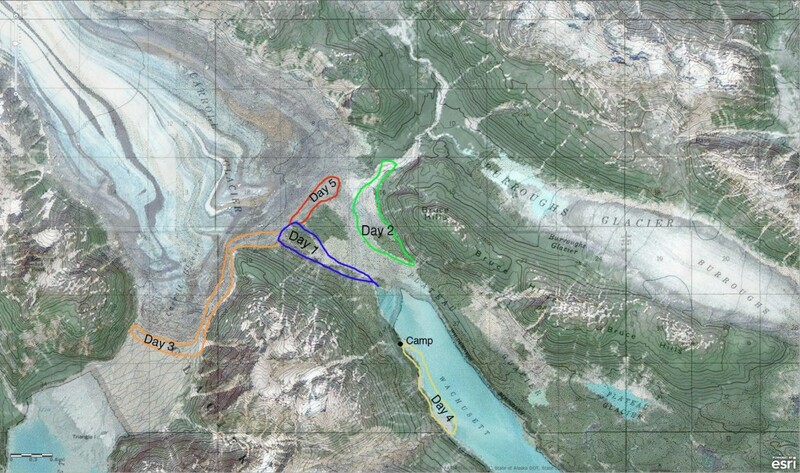 The sequence of events occurred under changing magmatic and eruptive conditions, which suggests that even small glaciovolcanic ridges can be constructed in a complicated manner. We must have walked 10 million miles. Our arrival at the southern end of Marble Mountain begun with the sighting of 3 orcas that as Dr. Wiles explained were a sign of good luck. Thus began the assent into the bug-infested shrubbery complete with thickets of devils club and raspberry bushes. We were trying to climb to 2000 ft. elevation set up camp and then climb 400 more ft., in order to reach the Mountain Hemlocks that we were going to core. 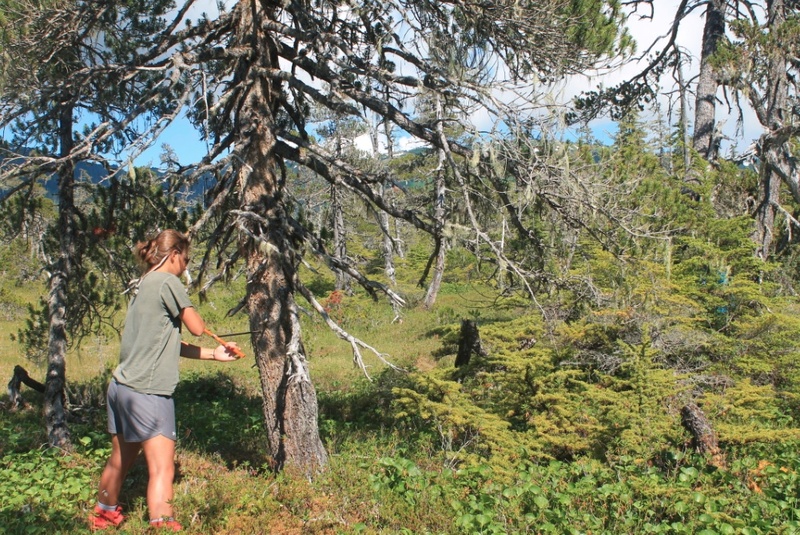 We were trying to core these particular hemlocks -because they are part of a Nunatak forest. A nunatak forest is an island of forest that survived the ice sheet moving over the area because of its high elevation. These trees would have been great for my thesis because of their age and high elevation. About an hour into our hike the sun was bearing down on us, it was 85 degrees out and we were out of water with no streams or snow melt in sight. As the elevation and incline rose so did our levels of dehydration, frustration and exhaustion and around hour 5 we made the executive decision to turn around. Although it was pretty disappointing not to be able to reach the trees we ultimately made the right decision because of the lack of snow melt. Two hours later after sliding, stumbling, and falling down the mountain all while dreaming about water we heard the sound of the river and stumbled into it chugging as much as we could. It was quite the adventure and although we looked it in the eye, Marble Mountain still holds its mysteries. Marble Mountain is the peak on the far left. Andy and Dr. Wiles trying to climb up the limestone rock face with 30 pound backpacks (our only break from dense Devils club and other shrubbery). Distressed after descending Marble Mountain (10PM). 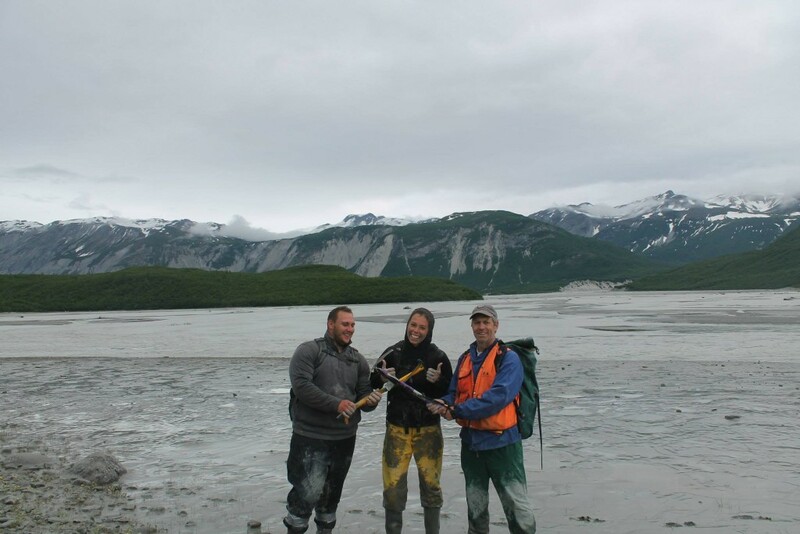 We were rescued from Marble a day early and decided to take some cores from excursion ridge. We cored Western Hemlock, Mountain Hemlock and lots of Shore Pine. Although Shore Pines can sometimes be hard to correlate well, they have recently been in decline for a variety of biotic reasons and we are going to see if there is any climate signal that can be related to their stress. The first day back (28th) we went up to Yellowleg trail, a lower site on excursion ridge, and started coring Western Hemlock and some Shore Pine. The lower elevation part of the trail started out dominantly a Western Hemlock forest opening up to more Mountain Hemlock and then ending with a bog full of Shore Pine. At the end of the day we were hiking along the road and saw a quartz vein that had been folded ductilely, which was really cool to see after learning about in structure. View at the base of the Yellowlegs trail overlooking Bartlett cove bay and Pleasant Island. 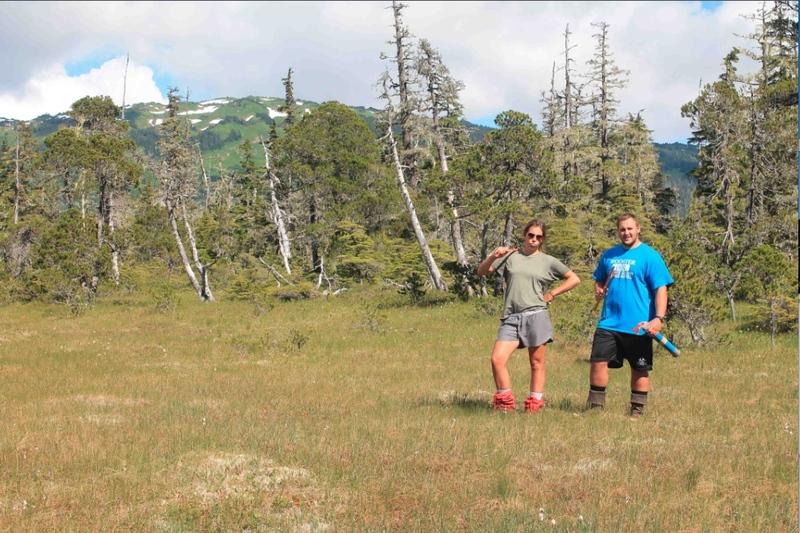 Our next two days we started coring more Shore Pines in the valley below Excursion Ridge and finished coring the Yellowlegs Trail. While coring the trees in the valley we encountered our first rainy day but we survived. These Shore Pines are younger than the ones we sampled the day before but hopefully they will still yield valuable data. Bog at the top of the Yellowlegs trail. 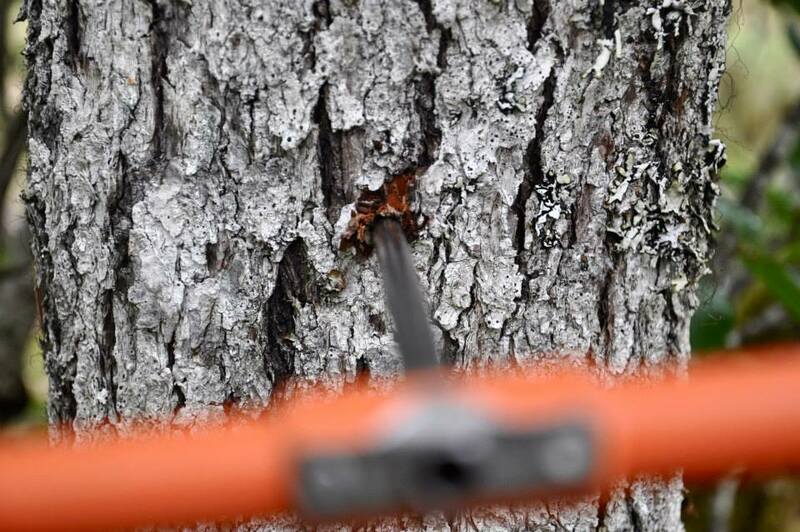 Coring a Shore Pine at the Yellowlegs trail bog. To end our time in Gustavus we were invited by the foresters to aid them in their rivalry softball game against the lodge. We were acting as cheerleaders to the game, until the 5th inning where, in only 2 innings Andy got a run, Jesse made a diving catch at shortstop, and then Andy, as catcher, proceeded to drop the throw to home plate that would have prevented the lodge from winning. We met some great people and were sad to leave but at the end of the game with Andy’s huge mistake it was probably for the best that we were leaving on the ferry the next day. On Saturday we took the ferry back to Juneau and there our adventure ended with a flight back to the lower 48 the next morning. 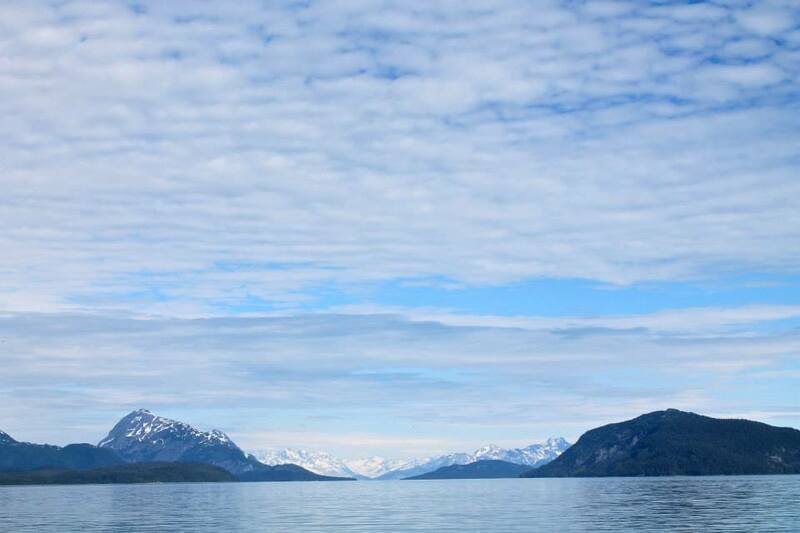 We looked it in the eye and what an adventure Alaska has been. 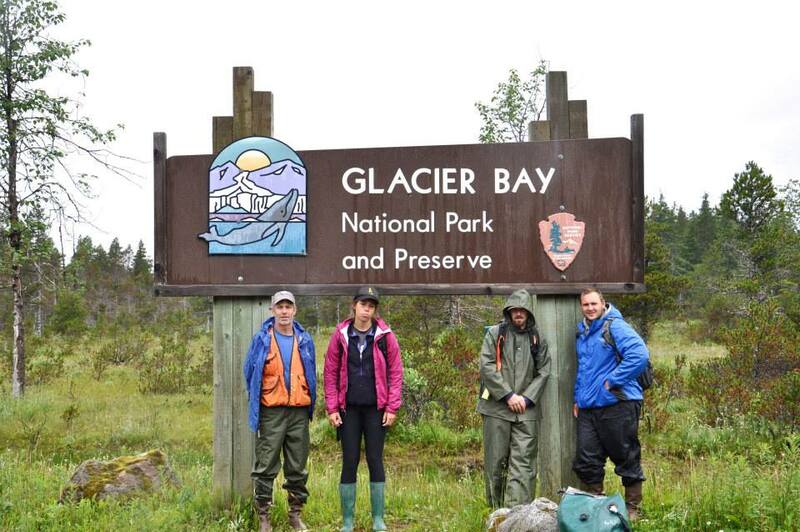 Team Alaska on a rainy day at the gateway to Glacier Bay National Park and Preserve. 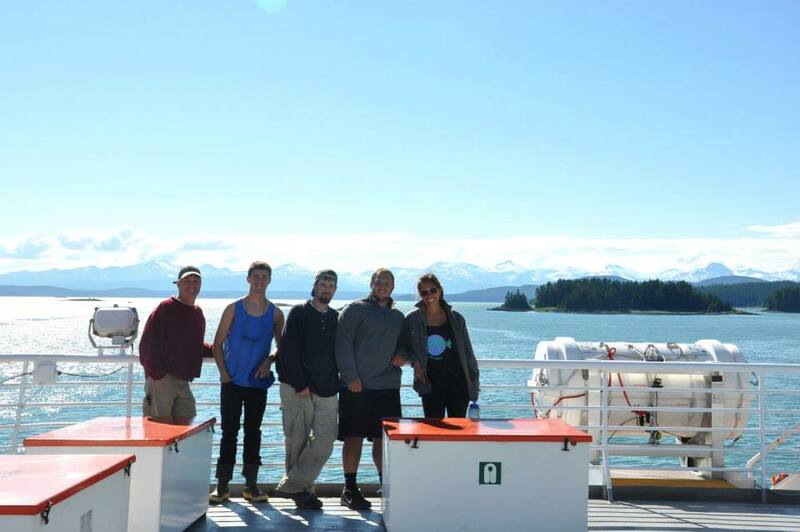 Team Alaska on a sunny day riding the ferry from Gustavus to Juneau. Gustavus, AK. 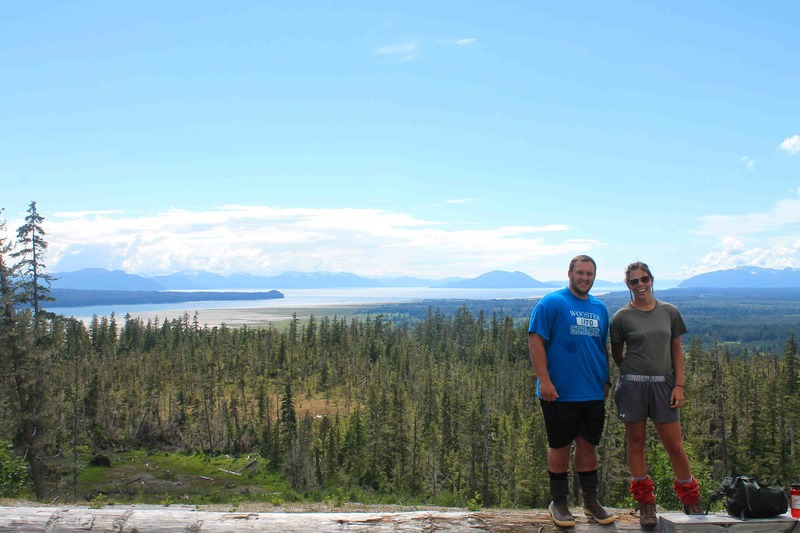 June 25, 2013 – As our research trip to Glacier Bay National Park and Preserve winds down we have some time to reconnect with the world and share some stories from our trip. The first half of our trip in the park was spent in Wachusett Inlet sampling logs and stumps that were killed during the advance of glaciers. 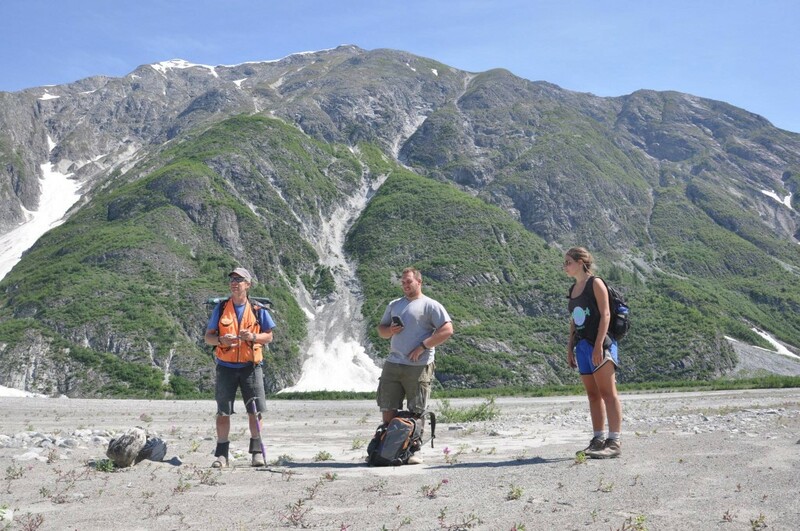 Our group of Dr. Wiles, Jesse Wiles, Abby Vanlueven, and myself set up camp on June 19th on the south side of the inlet as close to Carroll Glacier as we could get. Our camp was next to an alluvial fan, which had a stream fed by snow melt running through it. This camp made the perfect home for our 5 day stay. We were lucky to get great weather our entire stay in Wachusett Inlet. The temperature ranged from 70-80° F and it only rained once at night while we were in Wachusett. 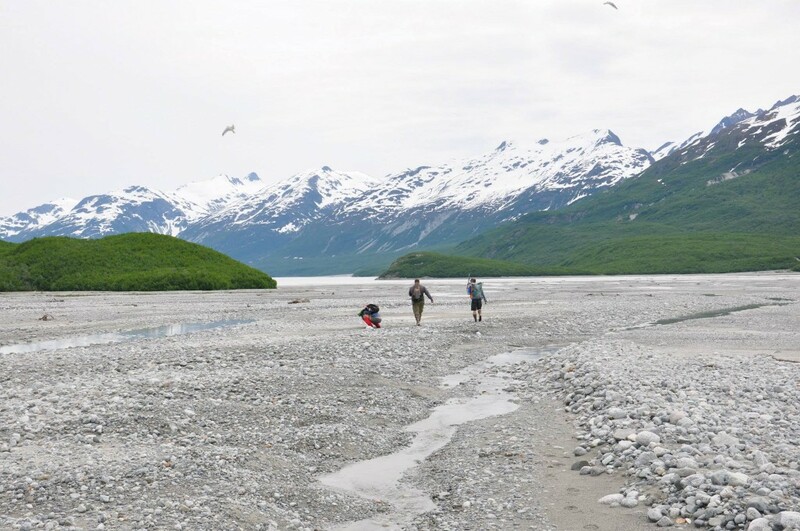 After camp was set up on day one the group kayaked and took a hike Northwest of the inlet and onto moraines formed recently by Carroll Glacier. This served as a way for us to get acclimated to the area and also to scout out potential sites for further investigation. On this hike we saw plenty of bear sign and moose activity but unfortunately we didn’t see either of the animals during our stay in Wachusett. On day two we sampled logs on the outwash plain to the north of Wachusett Inlet. 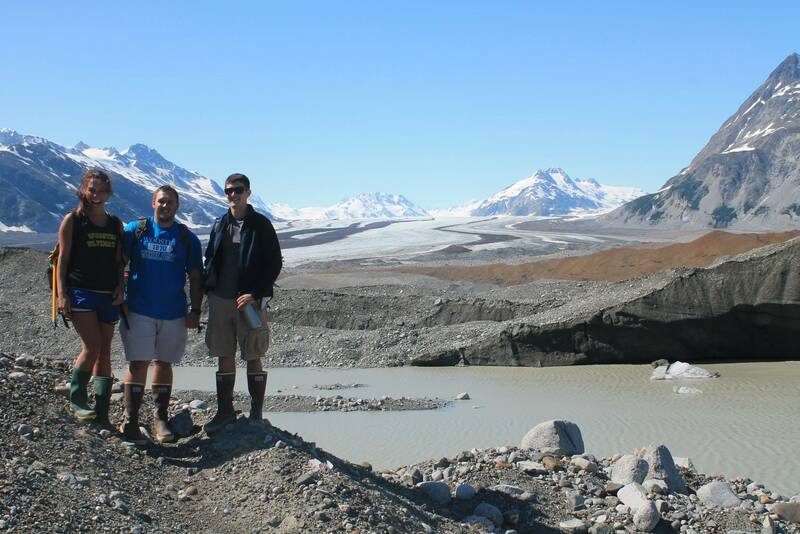 This outwash comes from Cushing and Burroughs Glacier which are located north of Wachusett and Carroll Glacier. 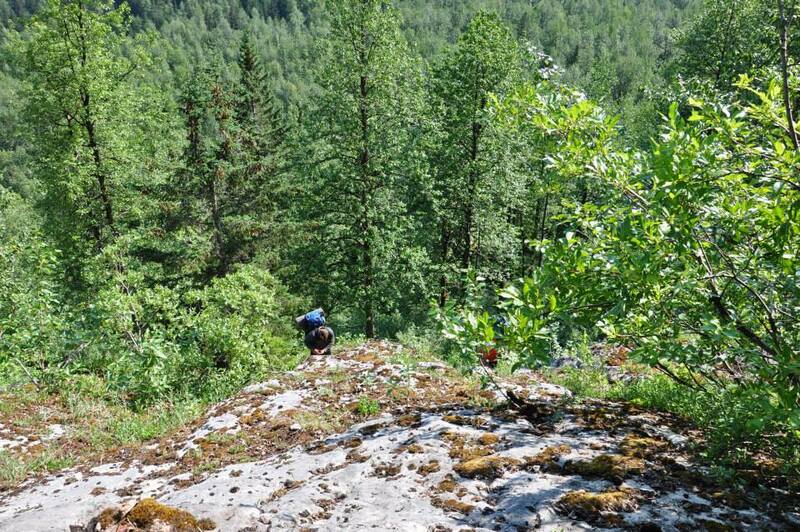 I described the stratigraphy of this valley cut by outwash as well as collecting core samples from detridal logs. As we hiked around this outwash plane we came across some birds that were not pleased with how close we were to their nests. They were relentless in protecting their eggs, swooping in from all angles and diving right at our heads. They only stopped when we retreated back to our kayaks. We finished off our day by running up two valleys on either side of the inlet to see if the river had eroded away any sub-fossil wood. Day three of our Wachusett Inlet adventure might be the most painful day for me to recount. I don’t think I will ever forget June 21, 2013. We didn’t realize until after that our longest day also coincided with the summer solstice. One this day we hiked from Wachusett Inlet to Queen Inlet by crossing over the glacial moraines we hiked up on day one. 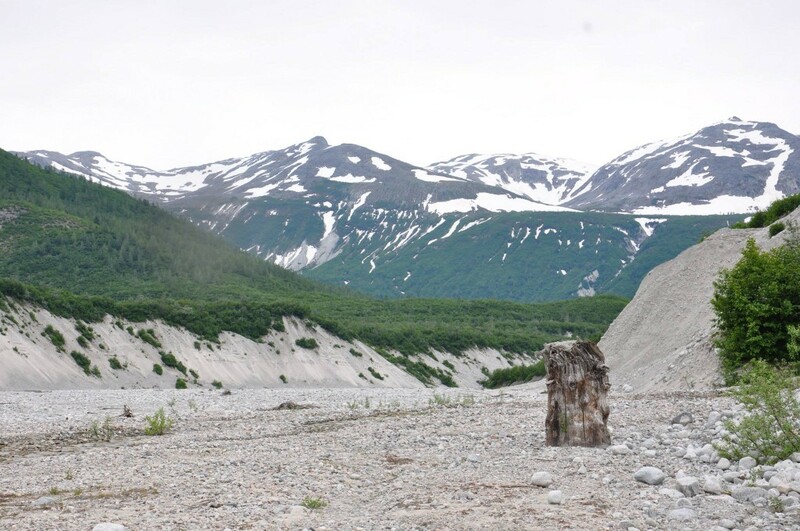 What was different on this day was the discovery that some of these glacial features had remnant ice under their slopes. This made for some interesting scrambles up slippery sand covered ice slopes, lots of frustration, and assistance from the ice ax. We estimated that after 6 hours and about 9 miles of tough hiking, we finally reached Queen Inlet. 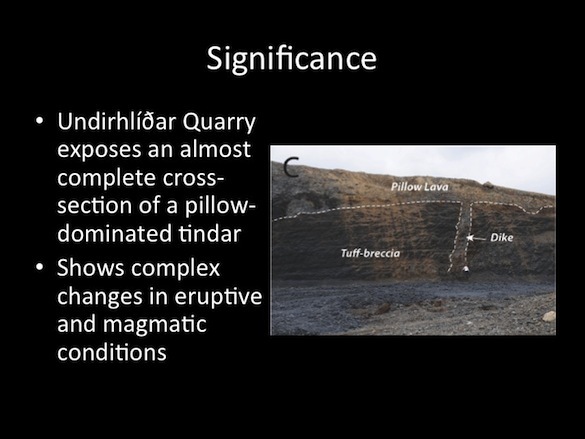 The outwash plane was massive, about 1 mile wide and 2 miles long. For all of that work we were rewarded with cores from 4 samples. Luckily the great views and feeling of invincibility we got after completing that hike overcame the soreness and fatigue when we woke up the next day. After our expedition the previous day we all agreed that day four would be a recovery day. We took a little paddle down the inlet to core logs brought down to alluvial fans by streams much like the one we camped at. Today ended up being our most productive day. 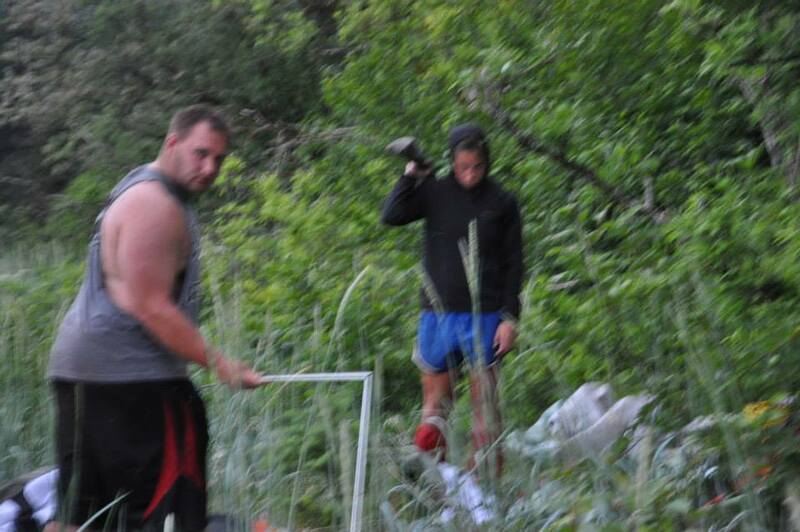 In total we sampled over 25 trees and took more than 40 cores. We called it an early day and went back to camp to play some cards which proved difficult with the wind and the bugs. Our final full day in Wachusett Inlet was dedicating to cover the last bit of ground that we hadn’t covered in the previous four days. We hiked back up to the moraines but turned north away from Queen Inlet (Thankfully). Our attempt was to go back to the outwash plain from day two and sample from the western side which was blocked off by a river. 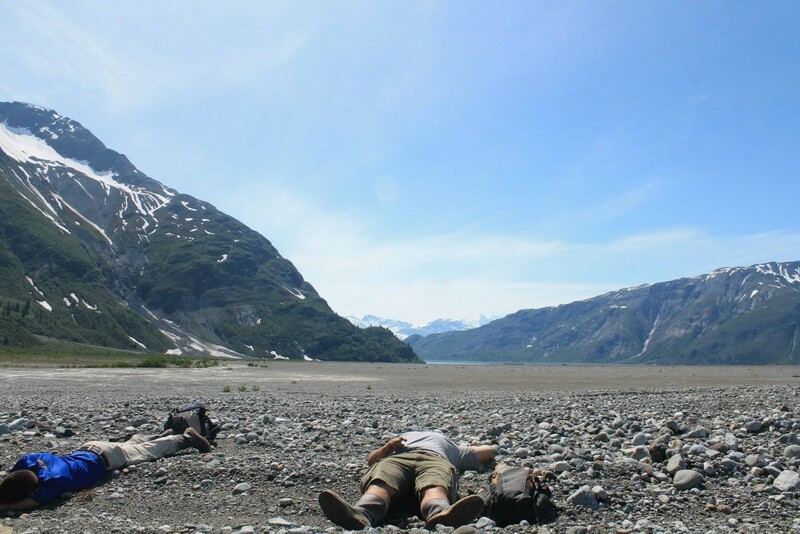 We soon learned that out effort were all for not as another outwash river came off of Carroll Glacier creating a wedge of inaccessible land between the two rivers. This was disappointing because I had hoped to describe the stratigraphy of this valley wall which was exposed a little bit better than the other side. We decided that the only motto that was appropriate for our trip to Wachusett Inlet was, “We looked it in the eye.” We covered every area at the head of Wachusett Inlet where sub-fossil logs could have been found. Our adventure in Wachusett might have come to an end but we still have more to report on as we spend some time on Marble Mountain and in Gustavus with plans to core living trees now. 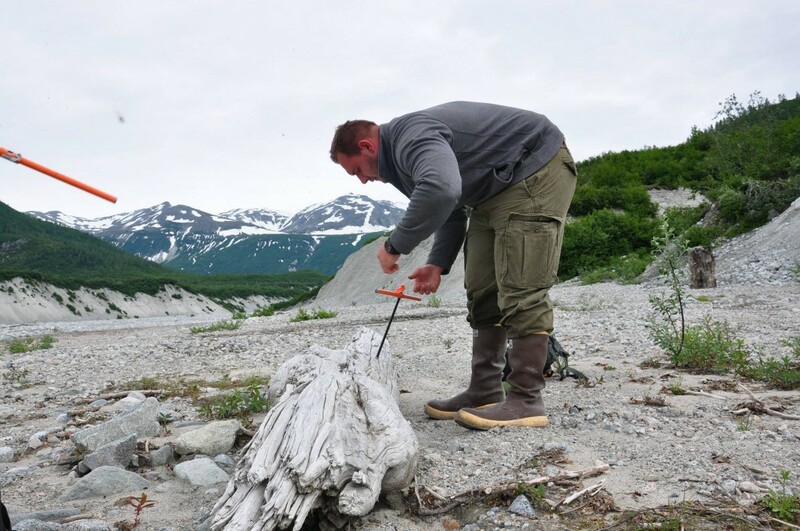 Be sure to watch for the next post from Abby about our further travels in Alaska.